I am sure I’m not the only one who looks at latte art and then wants to meet the wizard behind the amazing patterns?… I have always wanted to be good at creating latte art and with experience from my current job my confidence has grown. I work for the Tarro Lounge owned by a company called Loungers. I have been there for nearly a year now and have loved every minute of it and have learnt so many skills. Coffee making being one of them. We definitely do not lack the practice on a Sunday morning as everyone rushes in for their morning coffee boost. If you are interested in how we make the latte’s look fancy, then carry on reading. The most important thing in making coffee is how well kept your machine is. The cleaner the better. 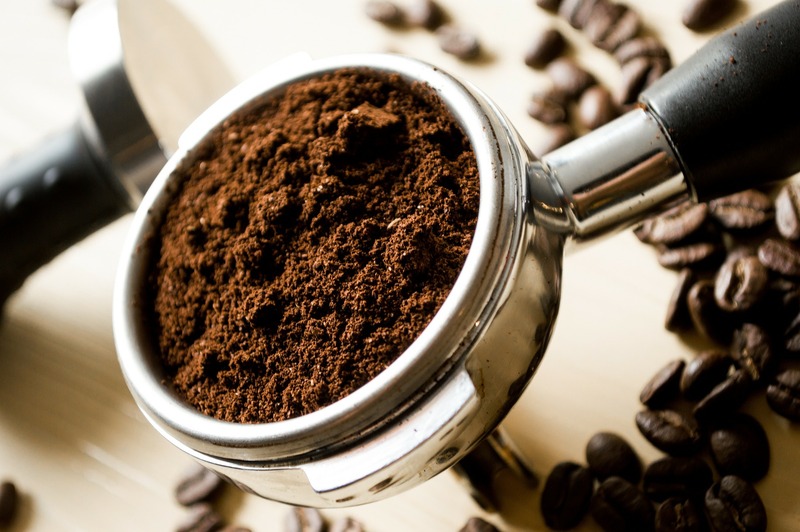 You also need a coffee grinder to get them fresh coffee beans down to size. A coffee machine can look quite nerve wracking at a first glance but there is no need to worry. I was stressed when I first saw one! First you need your Portafilter this is what the ground coffee is placed into before brewing the espresso. A more commonly used name is the “filter handle thingy”. 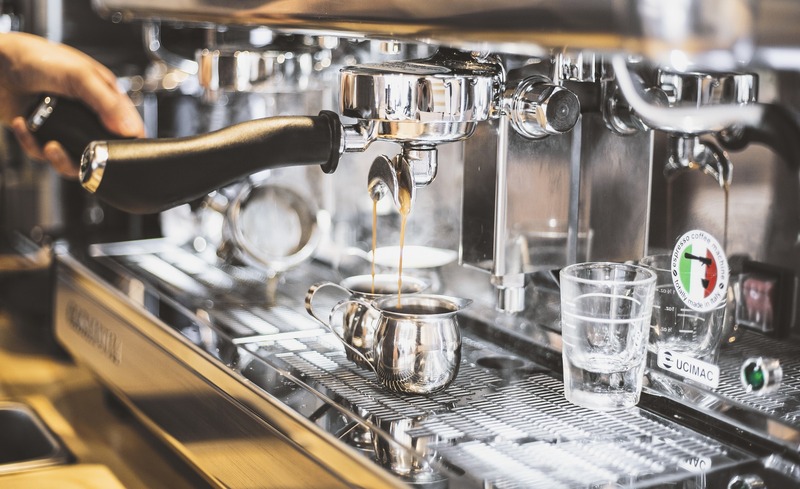 This is where the bean hopper comes into action, place the portafilter underneath the espresso grinder and this will either automatically fill it with grounded coffee beans or you will have to push it down. You should then have a portafilter with grounded coffee in but this definitely needs to look neater. The Espresso Tamper can fix this! You just push the tamper down onto the grounded coffee and it should become more compact, then ‘brace’ the filter (wipe away the excess coffee grains) now you are ready to brew a delicious coffee. 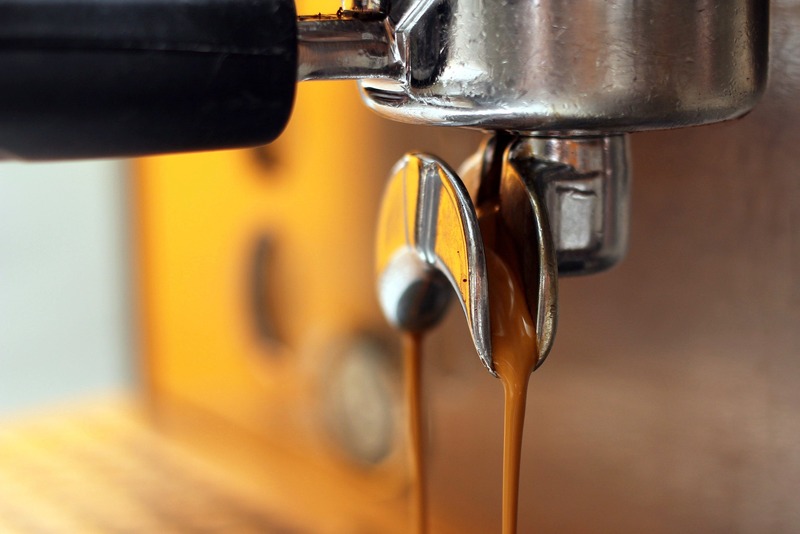 The portafilter can then be placed within the grooves of the coffee machine. Don’t forget to place your cup underneath the portafilter in order for the lovely coffee to be brewed into it. Now you have your coffee brewed it’s time for the fun part of making a coffee. Pick your milk, (whole, skimmed or soya?) any of these work with a steamer. When it comes to steaming milk for coffees they are all different techniques. The latte is a bit more difficult to master. If the latte milk is too ‘throffy’ (too much air) the latte art wont form properly. Which leads to strong disappointment trust me I have experience this! Fill your pitcher with milk about half way to the top. Then place the steamwand into the milk, you need to keep a close eye on the temperature to ensure you don’t burn the milk. It takes bout 30 to 60 seconds. Hold it at about a 45 degree angle to the pitcher. Bring the pitcher down letting the end of the steamwand slightly above the top layer of the milk to let in little puffs of air, then place the wand fully back in and steam till at the right temperature. This gives the milk a glossy layer on the top. This is when you have the perfect milk and ready to pour. This is the tricky bit which even myself I have not yet perfected. I don’t really use the normal technique and I don’t have the professional words for this either so bare with me. I have the coffee cup in my left hand and slightly tilt it, then with the milk pitcher in my right hand, I slowly start to pour it down the side of the cup just where the espresso and the milk meet so it starts to mix nicely. Then when the cup is full half way from the bottom, I start to ‘wiggle’ my hand from left to right and just as the milk get to the top draw the milk from the bottom to the top and this will create a feathered effect and you should get a heart latte pattern. This is the one of the lattes I’ve made on the left, it isn’t the best that I have done but you get the idea. This is not one that I have made but this is how it looks when someone professionally does it. If you want to jazz it up a little more I sometimes add some chocolate on top when I make myself a mocha. When the coffee is looking all glossy and lovely, it’s time to add the choc. So I draw a small circle in the middle and one around the outside of that. I then grab a coffee stirrer and from the outside draw it inwards. This creates a pretty little flower pattern kind of like a Hawaiian flower. I hope this was interesting for all you coffee lovers! Thanks for reading! Previous Post My Autumn Faves. Next Post 10 Things I Aim to do November 2017! Your doing super well. I am a professional Barista and it seems to me you hold your wand to close to the surface since you can see the micro-bubbles. When you steam your milk start with the wand in the milk to get it to spin then lift it up closer to the surface to expand the milk then put it back into the centre to swirl. Also use the fatty part of your hand (under your thumb) to feel the side of the jug rather then a thermometer. When the jug is just to hot to touch with the fat part of your hand then the milk is perfect. Also make sure to place the jug on the table and swirl until shiny. It makes it so much easier! Let me know if these tips help and i’d love to see more pics of your art.